My 100 Fan Milestone Celebration Giveaway had two winners... I selected the winner (via Random.org) and the person who referred her to my page also won. Thank you again to all of my fans. Two more talented glass artists stopped by the website to tell us a bit about themselves!! Patsy Evins of Patsy Evins Studio put together a page. And I've never purchased her beads (wipe that shocked look off your face...LOL) so it gave me a chance to get to know her, too. You can find Patsy's page here. And you can find Heather's page here. I hope you'll take a look at them...Enjoy!! Just want to let everyone know that I've started doing Fan Milestone Giveaways on my Facebook page. The 50 Fan Milestone happened before I even got to blog about it!! The next one is going to happen when I reach 100 Fans so stop by the Designs by Debi Facebook Page and become a fan to be entered to win. I'll be having giveaways at each 100 fan milestone. They'll be announced on my page and blog. I'll set up an album in my Facebook photos﻿ or put the photo in the post if it's just one item. Once the specified number of fans is reached, I'll select a winner using Random.org and post it on Facebook and here on the blog. My latest quest was to learn how to do giveaways and with some help from Karen at O. Sebastian (Thank you!!) I think I've got it down. So I'm getting ready to start having Fan Milestone Giveaways. The first is going to be when my Designs by Debi page reaches 50 fans. I'll get the info up in the next few days so head on over and become a fan!! My OOAK Mardi Gras Bracelet was featured in this great Collection on ArtFire put together by ButlerDidItDesigns. Better late than never...forgot to post it...sorry. Mardi Gras! Time to have some fun! Very nice collection... honored to be included :) Hope everyone enjoyed Mardi Gras! This is the Jewelry for Charity Piece for March. It's a OOAK bracelet in gorgeous, summery shades of orange, pink and white. I used polymer clay beads with flowers and dragonflies made by Bonnie Simonet and some orange and white swirled ones made by me. The Swarovski bicones are red topaz AB2x and they're perfect...they even shimmer with pink accenting the pink flowers in the beads (very tough trying to catch that in pix though). The week of March 21-27 is a Week of Solidarity with People Struggling Against Racism and Discrimination and March 21st is the International Day for the Elimination of Racial Discrimination. I chose the orange color scheme because the ribbon color for Racial Tolerance is orange. I wanted to select a charity committed to ending racism so I chose The King Center. Established in 1968 by Coretta Scott King, it's the official, living memorial dedicated to the advancement of the legacy of Dr. Martin Luther King, Jr., leader of America’s greatest nonviolent movement for justice, equality and peace. I hope we can one day achieve his dream of the Beloved Community, practice tolerance, appreciate each other's differences and live in peace. "No one is born hating another person because of the color of his skin, or his background or his religion. People must learn to hate and, if they can learn to hate, they can be taught to love, for love comes more naturally to the human heart than its opposite." So, does "Murphy" follow you around, too?!? Well, once I was home and started carrying things downstairs to put them away, didn't I just stumble landing sideways on my foot. It hurt, but I figured I just twisted it and it would go away. Well, it didn't...it got worse...my foot ended up looking like a little balloon! It ends up that I sprained my ankle. Well, at least we hope that's all...my doctor sent me for x-rays to make sure there aren't any fractures! Damn Murphy...again!! So, I'm curious...does Murphy follow you around, too? I hope not. I mentioned my addiction to lampwork glass beads the other day...well what an addiction it is! I don't dare tell you how many tackle boxes full of them are in my bead closet! These beads are handmade by glass artists and each one is a special little work of art. I absolutely love them and use them all the time, especially when I'm designing one-of-a-kind pieces. They're lovingly handmade one at a time by winding molten glass around a metal mandrel to form a bead and then decorating it. 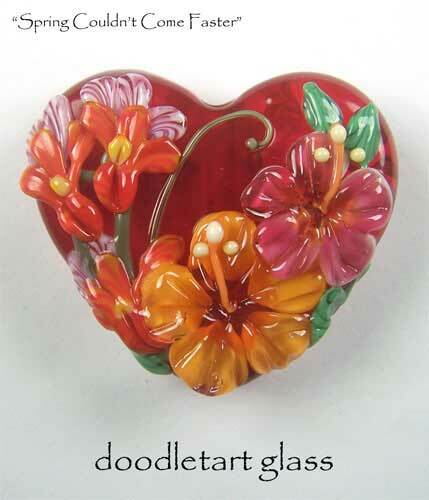 There are so many different glass types, glass colors, embellishement methods, etc. that the possibilities seem to be endless. I love looking to see all the newest ones, but then of course looking leads to buying...and buying...and buying. See how I ended up filling those boxes?!? It's so easy! Well, I've been wanting to share information about these beads and the artists who create them and I've finally gotten around to it! 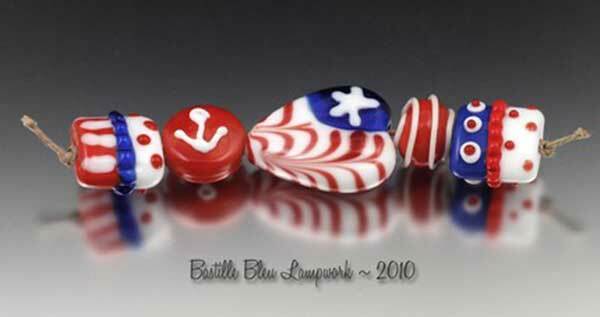 I put up a page about Artisan Lampwork Glass Beads on my website. And I've started extending invitations to some of my favorite glass artists to come over and put up a page telling us about themselves and their work. I thought that would make things more interesting. Check 'em out! I think you'll enjoy them. I try to put their beautiful beads to good use! They spark my creativity that's for sure :) Thanks ladies!! 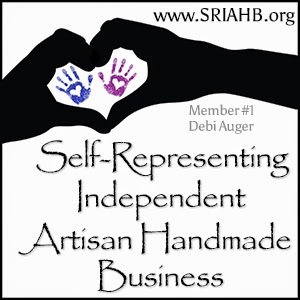 I want to share an important opportunity with other artisans today. Things are so tough for everyone in this economy, we need to make every penny count...and every penny does count. So, I want to make sure that all you guys know about ArtFire. It's a marketplace for Hancrafted, Fine Art, Vintage, Design and Media items as well as Craft Supplies. It's like Etsy, actually a direct competitor. One of the reasons I chose ArtFire over Etsy was fees. For a low monthly fee you can sell an unlimited number of items on ArtFire. They don't charge you to list items, don't charge a fee when you sell items...they just don't nickel and dime you (hello eBay...hello Etsy). I know that most artisans sell on Etsy. I have an account, but I just use it to buy from artists who only sell their products on Etsy...mostly lampwork glass artists (my addiction to lampwork glass beads is a whole huge topic for another day...lol). Anyway, the buzz is that many people are unhappy with Etsy's fees and a host of other things. I can't verify the complaints because I don't sell there. However, I do want to let everyone know they have other options. I've been happy with ArtFire and everything they offer. I have a Pro account with a "locked-in-for-life" rate (another great thing they do to save you money). I must say I've been very impressed with the ranking my items get at the search engines (another reason I chose them)...most of the time first page. And I get great exposure on TheFind thanks to ArtFire, too. I know that it's not as well known as Etsy and eBay and most people may have never heard of ArtFire, but the more of us who sell there, the better it will get because the word will spread. Look into it, compare it to where you're selling now and maybe add it to the mix to try it out. Right now they're having a promotion. You can Become an ArtFire Pro with this link and get your 3rd month free! If you use this link to sign up, I also get a free month AND until March 15th, whenever a new member referred by a current member (hence the tracking link) signs up for an account they're both entered in ArtFire's Share the Love contest to each win a Canon Rebel DSLR Camera!!! So if you've been contemplating trying other selling venues, this would be a great time for you to try ArtFire. I'd be curious to hear your thoughts on the various selling venues...and one I just recently heard about...Zibbet. If you have ideas or thoughts that you think would be helpful to others, please do share :) Thanx!